I live in Nashville, so I was having to hire a florist sight unseen. Our caterer recommended this florist, so I called and we had to do everything over the phone. When I walked into the venue the morning of the wedding, I was amazed at how perfect the flowers looked. They were exactly what the bride had requested and everything was beautiful! I wholeheartedly recommend Amelia Florist for any future event you might have. Their prices were reasonable and the results were outstanding! Thanks so much Amelia Florist! Amelia Florist did an amazing job! All of our flowers were put together beautifully. The bouquets were amazing, just as I pictured them. We had a flower arbor as well that Amelia Florist did a great job with! I would highly recommend them to anyone. During our first consultation, we had few ideas about what we wanted for all of the flowers. The consultant listened to our ideas, asked questions and then came up with excellent suggestions for our wedding party flowers. They even offered to make sample bouquets to give us an idea of what they would look like. When they arrived on the day of the wedding they were unbelievable. The color mixture and the greens used went perfectly with the wedding colors. 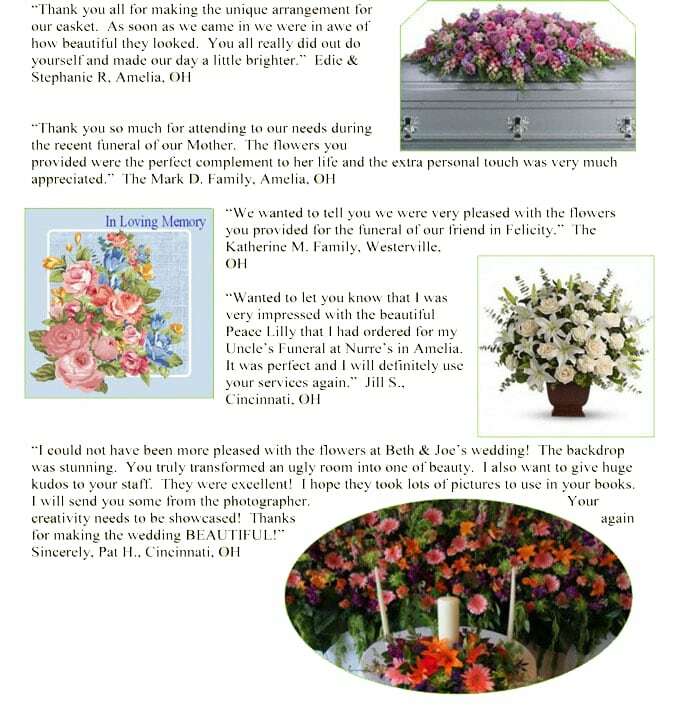 I couldn't even begin to count the number of compliments we received about how gorgeous our flowers were. We will definitely be using them in the future!